This chapter provides an overview of the strategic importance, key activities, and tools used to implement change in NPOs. Baluch draws on a wide body of research on organizational change in the nonprofit field to identify the unique nonprofit characteristics in implementing change and examine the facilitating role of learning, leadership, and organizational culture, and HRM during change. The chapter also addresses resistance to change and why change implementation fails in NPOs. Baluch further analyzes the dynamics of change, a range of strategic responses to the external funding environment and change strategies for different stages of a nonprofit’s development. These insights are drawn from a comprehensive research on organizational change in NPOs from 1998 to 2018, using the Web of Science database. 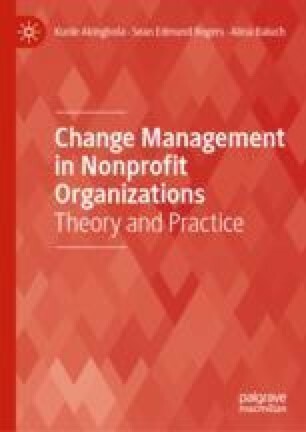 The chapter concludes with a discussion of the key findings and draws implications for nonprofit managers and employees when implementing change.